This is kind of like a cheater’s Chile Verde which is a Mexican dish with pork shoulder roast, roasted tomatillos, roasted poblano or Anaheim and jalapeno peppers, and a few other ingredients that is braised on top of the stove for a couple of hours. I do plan on making that and sharing the recipe later on but here is a tasty and quick play on those flavors. Place onions and garlic in the bottom of a 4 quart or larger slow cooker. 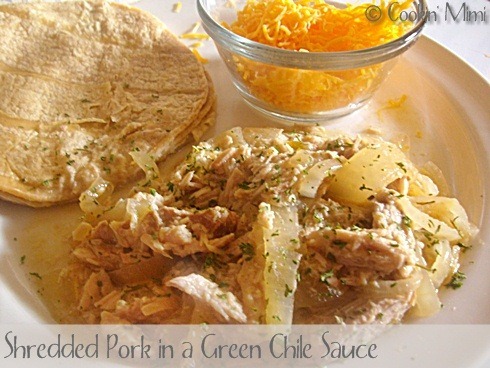 Add pork roast and pour salsa or enchilada sauce over all. Cover and cook on low 6-8 hours or on high 4-6 or until roast is tender enough to shred. Season to taste with salt and pepper. To freeze: portion into meal size servings and place in freezer bags or containers. Label and freeze. To serve thaw in refrigerator and heat in microwave or on the stove until heated thoroughly. Serve as desired. Did you like what you read? Leave a comment, I love hearing from you or share the post with your friends.